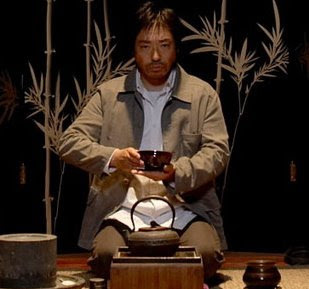 If you're passionate about Asian movies or tea esoterica you won't want to miss Tea Fight (Dou Cha/斗茶), a 2008 Japanese and Taiwanese coproduction where the gong fu involves tea arts, not martial arts. By turns serious, campy, and slapstick, the film features major stars, music by Sean Lennon, lots of Taiwanese teaware, some nice photography of tea fields and teahouses, a bubble tea subplot, and intermittent appearances by Hong Kong cinema veteran Eric Tsang (Zeng Zhiwei/曾志伟) as Tea Sage Lu Yu. It was gratifying to see a film where, for once, the special effects budget was devoted not to extra mayhem, but to brewing tea! We tracked down a Malaysian copy of Tea Fight with English subtitles on eBay; you can also find it on YouTube (no titles; dialogue in Japanese and Mandarin). After Lu Yu sets the scene with a brief prologue there's a fun introduction told as an animated version of a scroll painting. Then the action moves to contemporary Japan and Taiwan. It's not a film you watch because of the storyline, but the gist is that far back in history there were two rival teamaking groups, one whose "male" tea brought out aggressive qualities, and the other whose "female" tea was sweet and gentle. The rivalry escalated until the "male tea" faction destroyed the "female tea" clan. It's left to modern descendants of the groups to find one another and have the final tea fight to settle the score. I won't give away the ending, but if you're wondering how it all turns out, think "what would Buddha say?" in terms of determining the ultimate champion (with a little help from a wise tea master). Tea Fight was directed by Wang Yemin (王也民) and stars Vic Zhou (Zhou Yumin/周渝民), Zhang Juning (张钧宁), Erika Toda (户田惠梨香), and Teruyuki Kagawa (香川照之).